This week it's in the kitchen to see what's cookin' from Etsy Cottage Style. All week long you can see what is coming forth from the kitchen's of your friends around blogland. Most of my baking is done, but today I thought it would be fun to revisit a post from 2010 with a quick, fun and easy recipe for gift giving. Hope you enjoy! Have you been baking for Christmas? 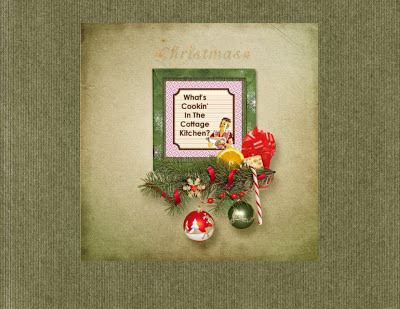 Do you make Christmas cookies a tradition in your family for home and gifts? I love to bake for Christmas and I try and make an assortment of cookies and candies for a variety on the cookie tray. However, each year, finding enough time for all this fun, is limited. I will get it all done in good time, but I found a little short cut for a gift idea and I thought I would share it with you today. I am calling my quick, easy and tasty snack mix, "Merry Mix" often known as Monster Mix in grocery stores and very expensive, plus, loaded with additives to preserve it's shelf life. So to start with you will need, a box of raisins, jar of unsalted peanuts, almonds, an average size bag of butterscotch morsels, milk chocolate chips and red and green M&M's. You can adjust this depending on what you like. Enjoy cashews, add them in. But remember to try and keep the ingredients compatible and those that go together. I might also say, this can also be made in Spring by using pastel M&M's. Finished and ready to give to family and friends, this mix is so yummy and looks festive in a candy dish. I hope you will try it or make your own combination of this idea for Merry Mix. It's fast and easy. Perfect to make when you are busy, but still want a little homemade treat to give. It won't last long either! Have a wonderful December day and enjoy the Christmas season to the fullest. I'll be back again soon to share more of my holiday decor and visiting you as well.